Who will speak for the children of Gaza? Note: Death toll numbers and headlines linked will no doubt transform over time as the ‘situation develops’ and information becomes more concise. The Fox News headline regarding the current Israeli offensive reads, “Sirens in Jerusalem: Israel’s ‘Iron Dome’ Intercepts Hamas Rockets”. Absent from the headline (and the majority of the article) is any mention of the 600 Palestinians injured and 88 killed, 22 of which were children (the current death toll at the time of my writing this) The full scope of damage inflicted in the recent days is immeasurable and will no doubt only escalate as the Israeli war machine begins ‘firing up’. Israel has dubbed this recent escalation Operation Protective Edge; referencing the recent abduction and murder of three Israeli teens for which Hamas has been blamed (despite any public evidence linking Hamas and a public denial by Hamas themselves). No doubt, the murder of those Israeli teens is unacceptable. The circumstances of their abduction and subsequent murder should be investigated. What has been the Israeli response, even before Operation Protective Edge? Hours after the Israeli teens were discovered dead, a 16 year old Palestinian boy was kidnapped off the streets of Jerusalem. He was found burnt alive. Investigators have discovered the innocent boy was forced to drink the gasoline which would then be set afire. Even less media has captured the brutal beating of a Palestinian boy by Israeli police following the aforementioned incidents. Video shows the Florida resident, visiting family in Palestine, being held down, kicked, and beaten by the Israeli police. Now the Israeli Foreign Affairs and Defense chairman has suggested cutting off all electricity and water to the Gaza Strip (only highlighting the current water apartheid being waged against the Palestinian people that we have exposed in the past) as Prime Minister Benjamin Netanyahu has said cease-fire is not even on the agenda. Is this justice for those dead Israeli teens? More death, violence, and tragedy? Not only must the lives of three Israelis be lost but hundreds upon hundreds of innocent Palestinians must suffer? This is not justice. This is genocide; a mere continuation of the colossal crimes against humanity committed by Israel against Palestinians over the past decades. The world should be asking Israel, where is the justice for all of those lives you have ruined? Israel has become judge, jury, and executioner in its own rigged ‘court of law’: the playground of real-time ethnic cleansing. Who is going to stand trial for the 88 dead Palestinians, the hundreds more wounded, the incredible loss of livelihood sustained by the Gaza Strip? No one. 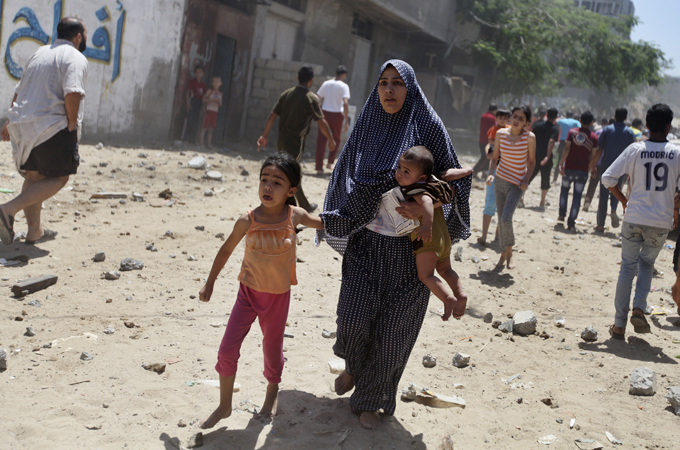 Who will speak for the children of Gaza? No one. The US and Western media has been largely complicit in the slaughter of Palestinians in the past years and this offensive is no different. Some outlets such as Fox News will go as far as to credit poorly-armed neighborhood militants such as those in Hamas for the carnage (as shown above). The American Israeli Public Affairs Committee (AIPAC), the go-to Zionist lobbying outfit in the United States, spent nearly $90 million in 2011 advocating for greater US ‘involvement’. Accordingly, the United States has promised (and partly delivered) $30 billion in aid towards Israel over the remaining decade. What has that money purchased? The bombs being dropped on Gazan children and their parents. The artillery shells which keep the Palestinian people awake at night. Maybe the gasoline that Muhammad Abu Khudair was forced to drink. Perhaps even the court which released Khudair’s suspected murderers. One must ask, if Israel is interested in a peaceful coexistence with its Palestinian neighbors (read: occupied population) why not spend the $90 million rebuilding Gazan schools, hospitals, and infrastructure? Why not take the $3 billion annually given by the US and invest it into life-affirming projects for the Palestinian people? The answer is quite obvious. So while tens of millions of dollars are being spent to give these murderers the loudest voice in the room, almost nothing is being said on behalf of the Palestinians. Before the media or any imperialist outlets try highlighting Hamas as this “voice for Gaza” let’s keep a few facts in mind. Hamas does not command an army, nor tank battalions, nor unmanned drones, nor a navy, nor an air force. They certainly are not spending $90 million dollars advocating that the US send them more weapons or receiving $3 billion every year in military aid. Hamas fires cheap rockets in a hopeless attempt at retaliation for the crimes they see being committed against their people. Ultimately, despite their numerous flaws and failures (both in form and substance), Hamas and the people of Gaza are simply surviving. The bombs are still dropping and if anything one could hope future generations will remember the unfathomable crimes committed. However, we should not let this deafening silence continue. We can start by calling this “conflict” what it is. And it is not a “conflict”. It is a crime against humanity. A blight on the course of human history. A genocide. Not everyone is going to say something, even those who call themselves “revolutionaries” or “radicals”; those who will speak softly of “social justice” but do nothing at all social for justice. The question then is how much more? How many more children have to die? How many homes destroyed? How many bombs dropped? How much annihilation must occur for the progressive elements of humanity to do something about this? Until the moment happens, when we say “enough is enough”, no justice will be brought for the Palestinian people; no one will speak for the children of Gaza. They will only keep dying. Would you say you support Hamas on an anti-imperiaist level (against Zionist attacks), on a political level or none at all? the author is correct as regards the status of hamas.hamas and the people of gaza are fighting to survive.with over 22o dead and 1600 injured the zionist states permanent primary accumulation by genocide will continue with imperialist complicity.hamas are by no means the most progressive of the palestinian liberation movement.However they undoubtedly constitute the group with the largest support in the Palestinian struggle for self determination[and increasingly survival].that said Khalid Mishal and Hamas leaderships support for pro-imperialist proxies in Syria entails a dual character re.anti-imperialism. good article.the zionist entity will continue its genocidal method of primary accumulation.this one also is”written in the annals of humankind in letters of blood and fire”.